The government today decided to reduce VAT (value added tax) on diesel from 14 per cent to 9.70 per cent, which will not only provide some relief to the consumers but will also help boost sales in the border areas. The government today decided to procure the seedling variety of mango at Rs 4.60 per kg and grafted varieties at Rs 5.25 per kg, the same as last year, under the Market Intervention Scheme during the current season. Major government departments will switch over to e-procurement with the launch of the e-tendering system by the Department of Information Technology in association with the National Informatics Centre. Chief Minister Prem Kumar Dhumal today alleged that people were fed up with the “anti-people policies” of the UPA regime and BJP workers would create awareness among the public by running a door-to-door campaign against price rise and corruption. Farmers of Salori in Amb subdivision of Una district have alleged that contractors given the task of channelling the Swan rivulet were damaging their agricultural land. State election commissions are finding it increasingly difficult to carry out the responsibility of conducting polls to the local bodies and Pachayati Raj institutions due to lack of adequate infrastructure, financial support and uniformity in rules. An orientation programme in planning and management of higher educational institutions for principals of graduate and postgraduate colleges commenced today at the Central University of Himachal Pradesh. The Education Department has failed to provide lecturers in eight arts subjects at the government degree college at Lamba Thatch in Seraj and continue to run classes in four sheds and panchayat ghar for the past four years. Hamirpur MP Anurag Thakur has asked the youth not to hanker after white-collar jobs, and instead try to seek employment in private companies as a large number of opportunities are available in the private sector today. Addressing people after inaugurating a youth training and development programme for unemployed persons at Badu today, Thakur said, “Since there are limited white-collar jobs available today, the youth should try for jobs in the private sector and for this I will myself make efforts to help them”. Anganwari workers from Nurpur, Jawali, Fatehpur and Nargrota Surian blocks held a demonstration at Jawali today to protest against the apathy of the state government towards their demands. Thakurdas, a resident of Dhar Karsog, has accused the Civil Hospital authorities here of medical negligence after his wife, Parvati (23), died in the hospital reportedly after she was given an injection by a nurse. The Investigation Officer (IO), who is investigating the fake degree scam case, today submitted his report in a sealed cover before the Himachal Pradesh High Court. After perusing the same, the court directed him to take the investigation to its logical conclusion with regard to fake educational certificates or degrees case. Twenty members have been elected in the elections for the Bar Council of Himachal Pradesh, the result of which was declared here today. The council elections are held after every five years. The government also waived off VAT on kerosene but it will not have any material impact as the commodity is only supplied through the public distribution system to consumers on which no tax is levied. The immediate impact will be that the price of diesel, which had increased to Rs 41.83 per litre after the latest increase, will come down by Rs 1.50 to Rs 1.60 per litre. Thus, 50 per cent of the latest hike of Rs 3 per litre will be absorbed. In fact, the reduction in VAT should have come much earlier as the state was losing revenue due to the low rate of VAT in the neighbouring states of Punjab (9.76 per cent) and Haryana (9.50 per cent). People of the border areas and truck operators, particularly those operating the 8,000-odd trucks deployed for the carriage of cement, were mostly getting their fuel from refill stations in the adjoining states. They will now prefer to buy diesel form local stations. More importantly, the reduction will not have much impact on the revenue, provided the neighbouring states do not effect any significant cut in the VAT. In the last financial year, VAT on diesel fetched a revenue of Rs 195 crore, up from Rs 149 crore in 2009-10, registering a growth of 32 per cent. On the face of it, a reduction of 4.30 per cent would have normally resulted in a loss of revenue to the tune of Rs 40 crore over the next three quarters but the increase in sales would to a large extent make up for the loss. However, the growth of revenue may not be as high as last year. The government has disappointed housewives as it has not provided any relief in the case of cooking gas. The decision was taken by the state Cabinet, which met here today under the chairmanship of Chief Minister Prem Kumar Dhumal. The scheme will be implemented from July 1 to August 15 this year and the HPMC, HIMFED and the HP Agro Industries Corporation will be the designated procurement agencies. In all,34 mango procurement centres will be opened. The Cabinet approved policy guidelines to provide compensation to farmers for the damage caused to their crops during construction activities by hydro-electric projects. It decided to incorporate one woman member in the State Review Board constituted to consider cases relating to pre-mature release and mercy petitions of prisoners. It approved four cases for pre-mature release and two cases of mercy petition to be forwarded to the Governor for approval. The Cabinet gave the nod for opening seven ayurvedic health centres at Viyunt village (Shardaghat) and Lounga village (Thanadhar) in Shimla district, Samtehan village (Gwalthai) and Tanbol village in Bilaspur, Neri village in Hamirpur, Dugilag village in Manali and Arki in Solan in Shimla. It granted permission to make all of these functional by creating and filling four posts of aurvedic medical officer on a contract basis. The Cabinet agreed in principle to execute an inter-state MoU for setting up a ropeway from Anandpur Sahib in Punjab to Naina Devi Temple in Himachal Pradesh. Chief Minister Prem Kumar Dhumal launched the e-tendering process for procurement of different commodities by floating two tenders, one of the Irrigation and Public Health Department and the other of the Public Works Department, together worth Rs 207 crore, with a click of the mouse. He said the system would save paper work, time, money and bring efficiency and transparency in the process. About 15,000 tenders worth Rs 2,000 crore are floated in the state every year. To begin with, the PWD, the Irrigation and Public Health Department and the Controller of Stores will be covered under e-tendering and later other departments will be included. Extensive training programmes have been conducted for officials as well as bidders. The Chief Minister was speaking at a conference of BJP workers from Shimla, Solan, Sirmaur, Bialspur and Kinnaur districts, organised to protest against black money, corruption and price rise, here today. “The recent hike in the prices of petroleum products has burdened the consumer, who was already finding it difficult to make both ends meet,” he said. He exhorted the party workers to reach out to the public with facts and figures about the “wrong policies” of the Congress-led UPA regime. “We need to educate people about the failure of the UPA regime in taking effective steps to check price rise,” he said. Dhumal said there was no VAT on kerosene in Himachal. The decision was aimed at providing some relief to the common man, who relied on it for cooking. “We have also reduced VAT on diesel from 14 per cent to 9.70 per cent as all commodities are brought into the state through road transport,” he said. He said the state government was making efforts at its own level to provide some relief to the people from the unprecedented price rise. “Under the Annapurna scheme, ration is being provided to eligible families free of cost to ensure that nobody is deprived of his daily bread,” he said. He said a sum of Rs 150 crore was being spenton providing subsidised food items, including pulses and cooking oil, to people at fair price shops. The Chief Minister said scams, including 2G spectrum, were the biggest contribution of the UPA regime to the country. “The BJP is committed to bringing back the black money from Swiss banks and with the Congress not divulging the names of those who have deposited the money, it is evident that the party does not wish to bring it back,” he said. 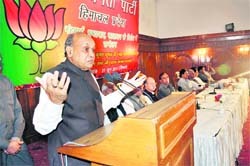 State BJP chief Khimi Ram Sharma exhorted the party workers to work in close coordination with the field functionaries to educate the people about the policies and programmes of the state government. Senior Cabinet ministers, legislators and party functionaries from the five districts attended the conference. They alleged that the contractors were lifting soil, sand and gravel from their agricultural land along the the Swan rivulet to save money. The soil, sand and gravel was being stolen from the land of farmers to construct earthen bundhs for channelling the rivulet. KD Sharma, an affected farmer, said illegal mining carried out by the contractors in their private land had rendered their land unfit for farming at many places. “They have dug huge pits in our land. Heavy machinery is generally stationed near our land by the contractors. Using the machinery, they illegally mine soil and sand from our land in the night,” he alleged. Jai Dev, another resident of the village, alleged that they had held many protests against the illegal mining being carried out in their land by contractors of the IPH Department. “We have even lodged a complaint with the local police. However, since the contractors are associated with powerful politicians, nobody is taking action against them,” he said. Superintendent Engineer, IPH, Una, Parvez Akhtar said even if certain contractors had stolen soil, sand and gravel from the land of farmers, the department has no authority to act against them. Sources said the contractors, who were stealing soil, sand and gravel, were allegedly submitting false bills to the department in which they were showing that the said material was being brought from distant places. This was the main thrust of the proceedings at the 15th All-India Conference of State Election Commissioners held here today. Governor Urmila Singh inaugurated the conference in which 21 states from all over the country participated. Unlike the Central Election Commission, the state commissions had no uniformity in rules and even the status of the State Election Commissioner (SEC)varied from one state to the other. For instance, in Madhya Pradesh, the SEC enjoyed the status and all other facilities on a par with a Judge of the high court but in some other states, he was ranked below the Chief Secretary. The commissions did not have their own buildings, computers, management information system (MIS), library and other required facilities. The dependence on government for funds and other facilities undermined their autonomy. Worse, the conduct of elections to the grassroots-level democratic institutions involved the same legal issues as those in the case of Lok Sabha and Assembly elections, but the commissions did not have any legal cell to handle the increasing litigation. Dev Swarup, State Election Commissioner, Himachal Pradesh, said the conference only discussed issues in the light of experiences of each state and it did not make any recommendations. The conference underlined the need for adequate budgetary provisions, computerisation with modern information technology for developing an electoral database, a management information system and electronic voting machine-handling capability. The Centre should come out with a scheme to provide these facilities and also take steps to ensure uniformity in status and service conditions of SECs and rules for the conduct of elections. The capacity-building programmes for principals of the region were organised by the National University of Educational Planning and Administration (NUEPA), New Delhi. The one-week orientation programme aims at providing understanding of the current changes in the higher education system and their implications for planning and management of colleges. It aims at enhancing the managerial capabilities of college principals through a better understanding of the current managerial practices. As many as 45 principals, out of whom 20 principals of graduate and postgraduate colleges from Himachal Pradesh, Uttarakahand, Jammu and Kashmir, Punjab and Haryana, are participating in the programme. The inaugural session of the programme, which was held on the Shahpur campus of Central University today, was presided over by Furqan Qamar, Vice-Chancellor, Central University of Himachal Pradesh. Prof ADN Bajpai, the newly appointed Vice-Chancellor of HP University, Shimla, was the chief guest. Speaking on the occasion, Bajpai emphasised upon the need for improving quality in higher education. Quantitative expansion was a necessity to increase larger participation in higher education but that would not be sufficient unless concerted efforts were made to improve the content and quality of higher education, he added. Prof Sudhanshu Bhushan, professor and head of the Higher Education Department of NUEPA, in his introductory remarks made a comprehensive presentation on the changing directions in higher education and emphasised upon the implications of the recent reforms initiatives in higher education in the country. Qamar, in his presidential remarks, observed that with over 800 universities and 31,000 colleges, India has the largest system of higher education in the world. However, even such a rapid expansion in the higher education appears much too short to meet the ever-increasing demand for the higher education in the country. During the week-long programme, organised by NUEPA in association with the Central University, eminent educationists, including Marmar Mukhopadhyay, Jaya Indiresan, Jandhyala BG Tilak, Sudesh Mukhopadhyay and Prof Sudhanshu Bhushan would deliver lectures and interact with participants. Students led by the left wing students union, SFI, today locked the classrooms and boycotted classes in protest. SFI leaders Ruplal and Lalit Kumar told The Tribune that they have no lecturers in history, political science, public administration, sociology, maths, music and Sanskrit. Though the new session had started on June 11, students could not opt for these subjects as there were no lecturers available, leave along science labs or library, students resented. The college started in 2007 in the three sheds of the primary school and a panchayat ghar, but the work on the new college building was going on at a snails pace. College had over 250 students last year and had already over 150 students but there were no teachers, locals added. College principal YS Mahant said, “Other subjects could not be started due to lack of accommodation and faculty here. A sum of Rs 3.5 crore has been deposited with the PWD for the building.” Meanwhile, director, education, OP Sharma, said the government was aware about the matter and would recruit the staff as per need. He said, “Through this programme, LS Industries Limited, a leading industrial house, will provide free training to unemployed persons and later give them employment in various positions”. The MP said the government was committed to providing employment to unemployed persons through various means. Thakur said, “Efforts are afoot to open a BPO call centre at Hamirpur and a few new training programmes will be launched in the training centre in the coming days”. Led by Ashok Katoch, Kangra district CITU secretary, and Sareshta Sharma, district secretary of the Anganwari Workers Union, the workers took out a procession raising slogans in support of their demands. The union leaders, while addressing the rally, criticised the state government for not paying heed towards their demands and accused Social Welfare Minister Sarveen Chowdhary of being anti-women. Later, the workers, under the banner of CITU, submitted a memorandum to Chief Minister Prem Kumar Dhumal through the local SDM. Their major demands include the immediate release of arrears after enhancement of their remuneration by the Union Minister, Rs 2 lakh and Rs 1.5 lakh as gratuity to anganwari workers and helpers, respectively. However, the postmortem report, which is officialy awaited, had given a clean chit to the hospital stating that the patient died due to low BP and other problems, and not due to the injection, claimed doctors. Though the police has lodged an FIR in the case at the Karsog police station, family members of Parvati gheraoed the hospital, demanding action in the matter. Thakurdas said Parvati was admitted to the hospital on Saturday. She was given medicines and an injection after which her condition improved. However, she complained of stomach pain yesterday morning following which a nurse gave her an injection after which she collapsed and died, he alleged. Dr Anup Shivraj, who was on duty, denied the allegation, saying that there was no negligence on their part. The BMO, Karsog, Dr KK Chauhan, said there was no medical negligence in the case. “They have sent the body for a postmortem to the IGMC, Shimla, for the satisfaction of the family members. The report is officially awaited,” he added. After hearing the case, a Division Bench comprising Chief Justice Kurian Joseph and Justice Sanjay Karol further directed him to file his action taken report within four weeks. The court passed this order on a petition filed by a retired principal, who had obtained information under the RTI regarding educational degrees of four government employees from Magadh University and Rajasthan University, which indicated that the documents were fake. In its earlier order, the court had directed the IO to investigate the matter involving four Education Department employees who allegedly had secured jobs on the basis fake documents pertaining qualification and submit his confidential report. A total of 61 candidates contested from different District Bar Associations in the state. The winners are: Ramakant Sharma, RK Gautam, NK Thakur, NK Sood, Balbir Singh Chauhan, IN Mehta, Ajay Chandel, Rajinder Dogra, Vikas Rathore, Suneet Goel and Neeranjan Verma, Bhoj Chander, Amit Vaid, Rajiv Rai, Sandeepan Sharma, Harinder Singh Negi, Narinder Gularia, Gaurav Pathnia, Vipin Pandit and Des Raj Sharma.